There are several events/opportunities in the works that might be of interest to you . . . .
Visit http://conference.surfacedesign.org/index.php (conference.surfacedesign.org will lead you there as well) to register for Confluence, the 2011 International Surface Design Association Conference in Minneapolis-St. Paul. Late fees for conference and workshop registration ($40.00) will go into effect on May 1, 2011. 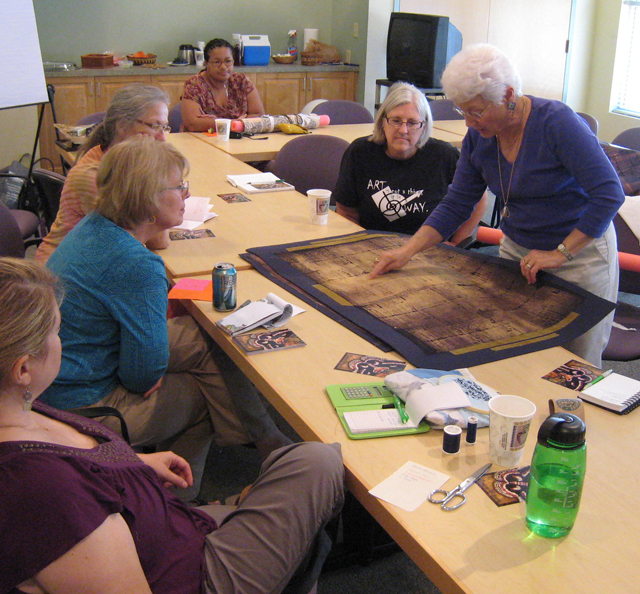 After May 1 any remaining workshop spots will be open to the general public—membership is not required. Fees will be the listed workshop price plus the $40.00 late fee. CONFERENCE TESTIMONIAL FROM ASTRID BENNET (SDA Board) If you are unsure about attending the conference, perhaps you’d be interested in hearing two sets of thoughts about it. To me, Astrid, the conferences have had life-focusing aspects that have helped me view my own work and career in a more useful way. And I’ve usually made great friends who understand my creative obsessions. It’s expensive, yes, but not every year, and I do believe that SDA tries very hard to keep costs as minimal as possible. I’ve also had the same response to my times at Penland– these have really turned the careers around of many artists I know. Plus, who wouldn’t mind getting away from ordinary life and dishwashing and picking up after family members or dogs– or yourself. Once you’ve been to a conference, all of this becomes clearer. To me, it’s an excellent investment in my future, and it’s also tax deductible for those with art businesses. Members’ profiles are available to update – NOW! Approximately 30 artists submitted to the Common Threads exhibition, organized/hosted by the KY Chapter of SDA and the Claypool-Young Art Gallery at Morehead State University June – July 2011. I will be contacting artists within the next two weeks about accepted works. Thank you for taking the time and effort to submit! The KY SDA Mini-Conference will be held on Saturday, June 4 from Noon – 5:00 p.m.; the opening reception for the show is an associated event scheduled from 3:00 – 5:00 p.m.
For those of you in driving range, please remember the sculptor/performer/fashion designer Nick Cave will be speaking on Thursday, April 14 @ 7 p.m. at Morehead State University, and it is free and open to the public!!! Enjoy the spring that is FINALLY here! The KY SDA Critique in scheduled for this Saturday, Jan. 15 from 2 – 4 p.m. in Versailles @ the Presbyterian Church as before (for directions, please e-mail j.reis@moreheadstate.edu). 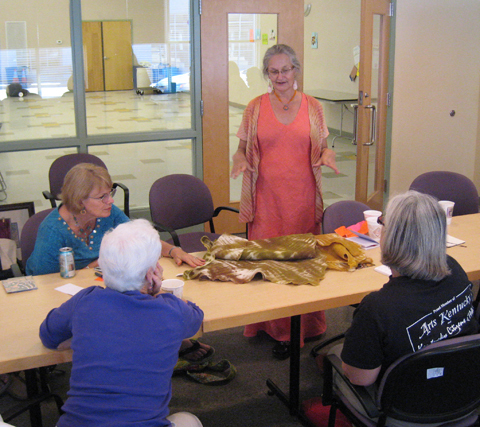 LAFTA (Louisville Area Fiber and Textile Artists), The Hite Art Institute University of Louisville, the Carnegie Center for Art and History and the Jewish Community Center are collaborating to welcome Jane Dunnewold to Louisville, January 26 to February 2, 2011. 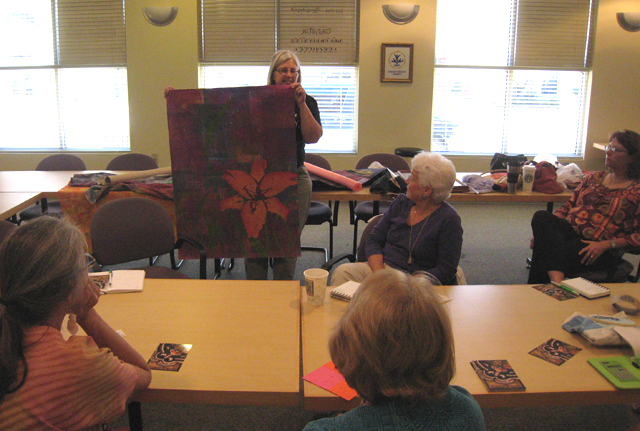 Jane Dunnewold is an internationally recognized leader in the field of textile art. She is the author of Art Cloth: A Guide to Surface Design on Fabric (Interweave 2010) in addition to a number of other titles. Her work has been exhibited worldwide and in 2002 won the Gold Prize at the Taegu International Textile Festival. 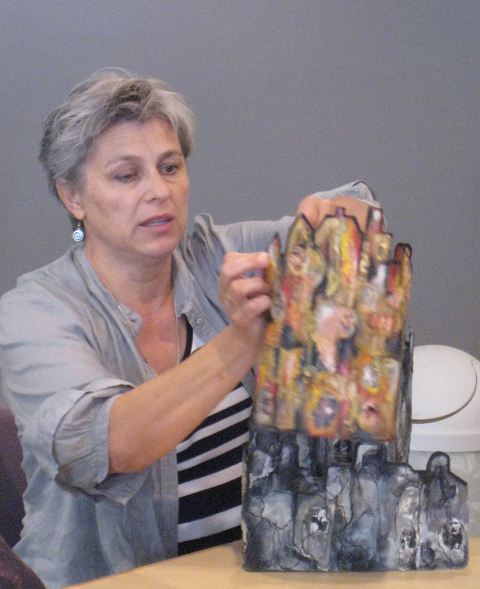 She is a former vice president of the Surface Design Association and maintains Art Cloth Studios in San Antonio, Texas. 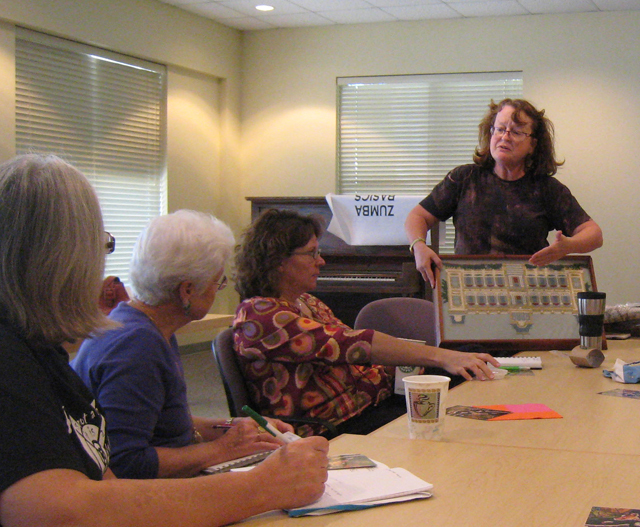 Jane teaches a dozen workshops a year and writes about the creative process at existentialneighborhood.blogspot.com. See and read more about her work at http://www.complexcloth.com. The Hite Art institute will open an exhibition of the fiber artist, Jane Dunnewold titled “Etudes: A Daily Practice.” The exhibition is at the Hite Galleries, Schneider Hall , Belknap Campus, University of Louisville from January 10 through February 13, 2011. Hite gallery hours are Mon.-Fri., 9:00 am- 4:30 pm; Sat., 10: 00 am-2:00 pm; & Sun., 1:00-5:00 pm. In addition to this exhibition, the artist will be a visiting artist in residence and deliver the Jane Morton Norton Memorial Lecture at the University on January 26, 6:00 p.m. in the Chao Auditorium of Ekstrom Library. Her lecture is titled: Mining for Meaning: How do ideas manifest in unexpected ways? Where do outrageous inspirations come from? Following the lecture January 26, at 7:00 p.m. there will be an Artist’s Reception for Dunnewold at the Etudes: A Daily Practice – solo exhibition of her work at the Hite Galleries in Schneider Hall, nearby Ekstrom Library on the University of Louisville’s Belknap Campus. In addition, there is a LAFTA Member exhibition at the Patio Gallery, Jewish Community Center, for which Jane served as Juror. The show extends from January 16 to February 22, with a reception on January 30, 2:00 to 4:00. At 1:00, prior to the reception, she will present a juror’s lecture. Patio Gallery, Jewish Community 3600 Dutchmans Lane, Louisville. SDA KY’s September Meet & Greet, plus news! 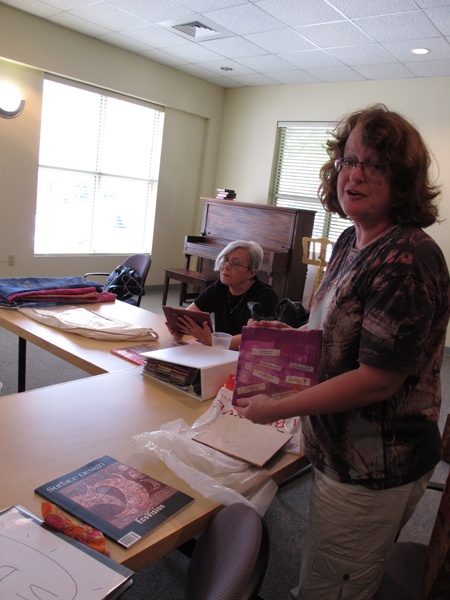 On September 25th, the Kentucky chapter of SDA had its second Meet & Greet, with an informal presentation on . . . . PRESENTATION! 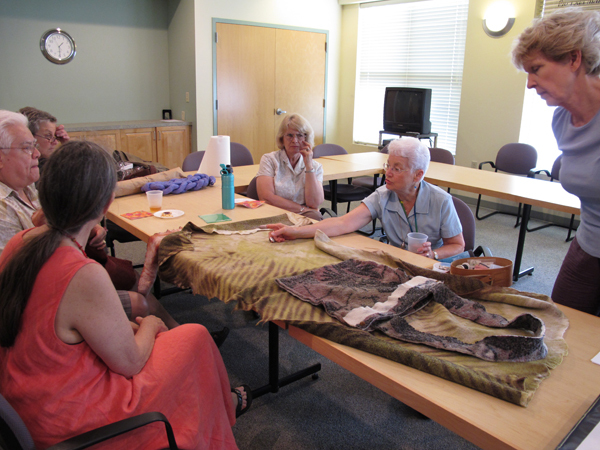 Artists brought pieces in to share with the group their methods of presenting textile work, and also solicit ideas about displaying specific artworks. Artists in attendance were: Laverne Zabielski, Cindy Vough, K. Crane, Mary Nehring, Dina Buckey, Anna Wieczorek, Marti Plager, Karen Davis, Laurie Appleby-Williams, and myself (Jennifer A. Reis). 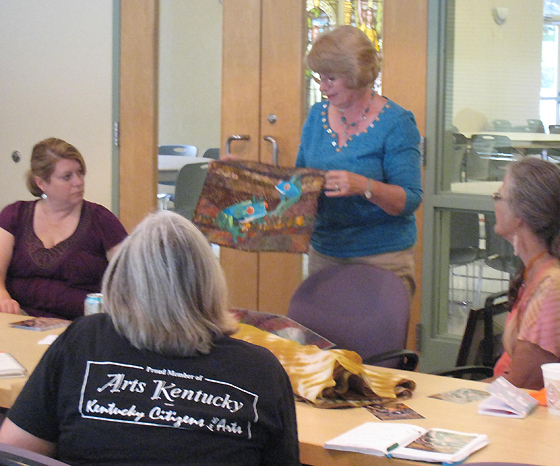 Based on the lively discussion sparked between artists about different works and presentation ideas, participants decided that the dialogue was so valuable to warrant scheduled KY SDA Critiques. 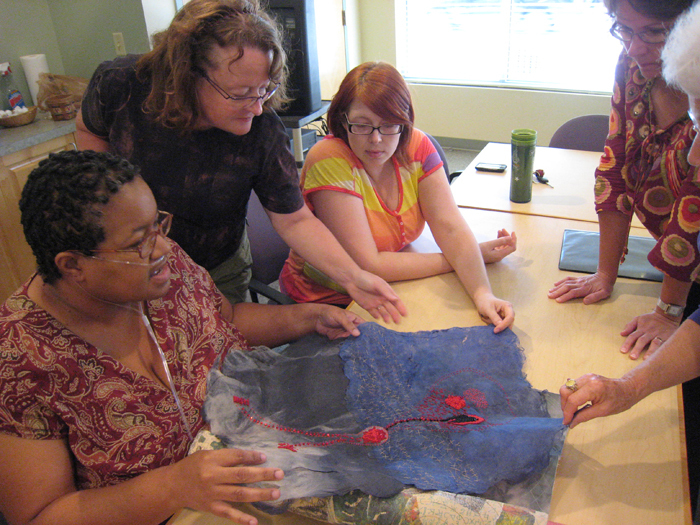 As artists who often work alone, the opportunity to get together to share and request feedback on artwork is invaluable. It’s hoped that these will become a regular feature of the Kentucky SDA chapter like the Meet & Greets. So . . . the first KY SDA Critique will be held the afternoon of Saturday, January 15 (weather-dependent!) in Versailles at the Presbyterian Church. 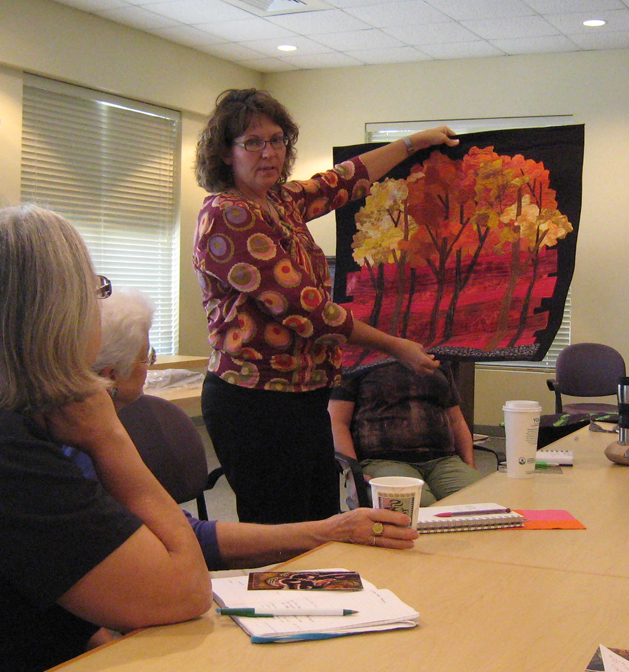 People are encouraged to bring artwork to discuss. Information in regards to the critique will be sent via e-mail in late December/early January. Interested parties can contact me at j.reis@moreheadstate.edu for more info. 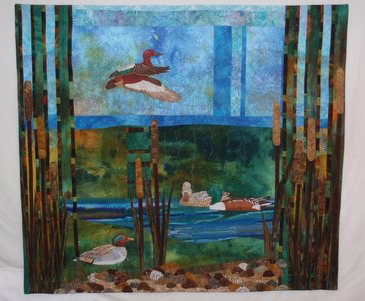 Finally, congratulations to Marti Plager as an exhibitor in the most recent manifestation of Quilt National at the Dairybarn Arts Center in Athens, Ohio – see a picture of Marti with one of her pieces below. For more information about the SDA Gathering at Syracuse University on Saturday, September 11, in New York, visit the NY SDA blog: http://sdanewyorkminute.blogspot.com/. 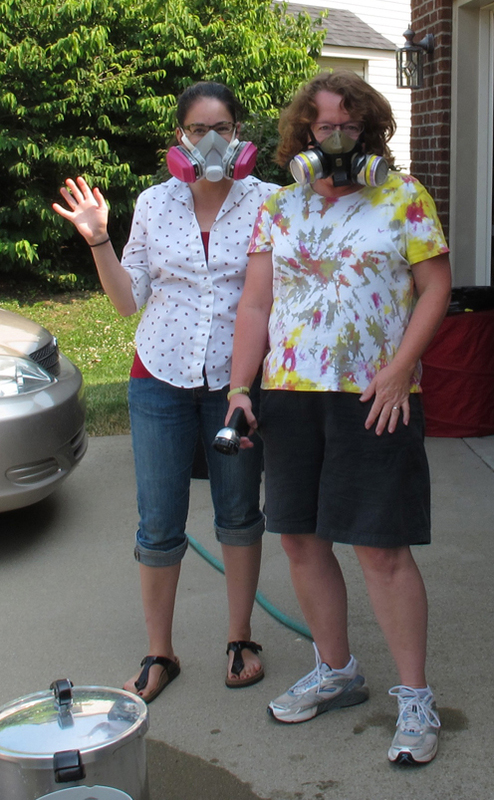 Thank you for visiting the blog of the Kentucky chapter of the Surface Design Association! We intend to use this as a means to publicize the work of the KY SDA, whether as a group with documentation about our Meet & Greets and exhibitions or focusing on the artistic accomplishments of individual Kentucky SDA members. While all folks interested in working (or appreciating!) 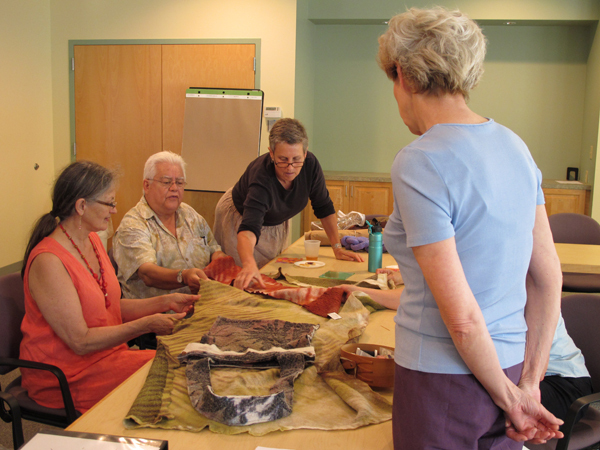 art from fiber/textile materials are invited to our quarterly get-togethers, only SDA members are able to participate in our art opportunities like exhibitions and publicity courtesy of this blog. So – if you’re not a SDA member, please consider joining by visiting the SDA WEB SITE (click it!). KY SDA had its first Meet & Greet this past June in Versailles. The turnout was good for the first time, and people brought their artwork to share which was a great opportunity to see what people are up to! Also, we had a short program and discussion about how to photograph your work very “quick and dirty”, and that led into the idea that at our next Meet & Greet (scheduled for Saturday, September 25 from 1 – 4 p.m., Versailles), we should have the program on different methods/means of display textile/fiber art (including 2D & 3D work) in different contexts – exhibitions, craft shows, etc. We’re very much looking forward to seeing more fiber folks at the next Meet & Greet – remember – Saturday, September 25th from 1 – 4 p.m. in Versailles. For more information, please e-mail j.reis@moreheadstate.edu – we’d love to have you! Upcoming posts will include information about individual artists (including studio tours!) and what will hopefully be the first KY SDA exhibition at the Claypool-Young Art Gallery at Morehead State University in the summer of 2011, with associated mini-conference the first Saturday of June. Stay posted!